Crosman Airsoft Target Board. Airsoft. 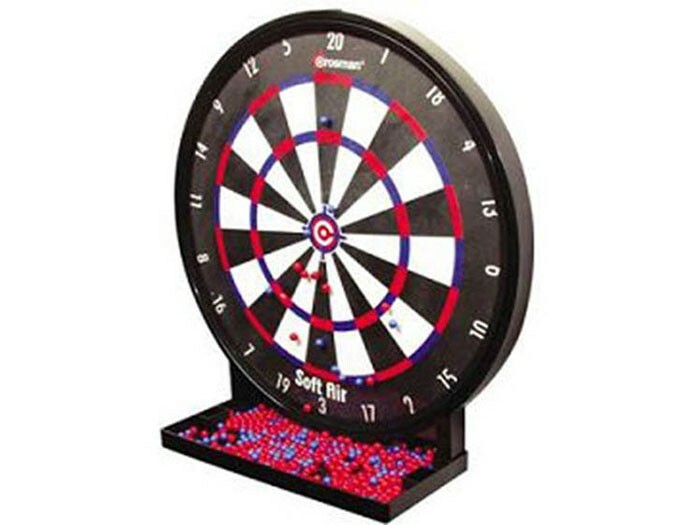 This target game board features the same scoring as the dart board. 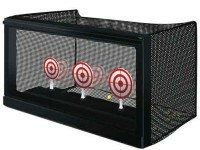 The target is designed specifically for plastic airsoft BBs. The special adhesive rubber pad lets the BBs stick to the target face and automatically slide down into the tray underneath. For airsoft use only. Use guns that shoot up to 300 fps with .12-gram airsoft BBs. If you use a more powerful gun or heavier ammo, the BBs will bounce off the target face instead of dropping into the collection tray at the bottom. Things I liked: Lightweight, easy to use, reasonably sticky. I don't ever play 'darts' with it, I just use it as a target for various CO2 airsoft handguns. The tray is nice because it allows the BB"s to just roll down into it. Things I would have changed: The gel is installed over a layer of plastic. I have had three of them and eventually, the plastic always breaks and starts letting the BB's through. 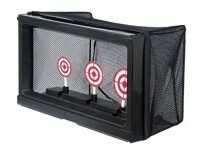 Part of that is that since I am only using it as a bullseye I tend to shoot the same place everytime. I had also had incidents where one BB has struck one already on the board. That usually results in one of them flying off the board. What others should know: Vary the location you are shooting. Either use it as a dart board or (what I do) put stick on bull's eye target in a different location for each session.. Things I liked: Perfect target for us. Things I would have changed: Perhaps 24" instead of 12". What others should know: Decent product, we are enjoying irt. Things I liked: I works, It's ten bucks, it's not bad. Things I would have changed: The BB's start moving too soon. I don't know exactly where I hit before the BB starts to roll down the board. Except with my little addition. What others should know: I have been shooting 18 feet down my hallway(from a wheel chair broken leg) I couldn't see where I was hitting. I recently purchased a laptop bean bag that included a cheap battery operated light. Just for the heck of it I wrapped up the snake end of the light and positioned it next to the tray of the target, shining upwards. WOW! not only did it light the target the greenish/yellow BBs I used lit up like a black light painting or like little round glow sticks. Works really cool. Maybe someone will come up with this as part of a target??? whatever the material is for making to bb's stick for a while, what it is and will it last forever? ?